Ever eaten a $900 lobster roll? Devoured a tower of crab rangoon nachos? Dive into our list of 25 dishes that make a splash and see how Boston is reinventing seafood—all over again. By Scott Kearnan·	 3/29/2019, 12:49 p.m. 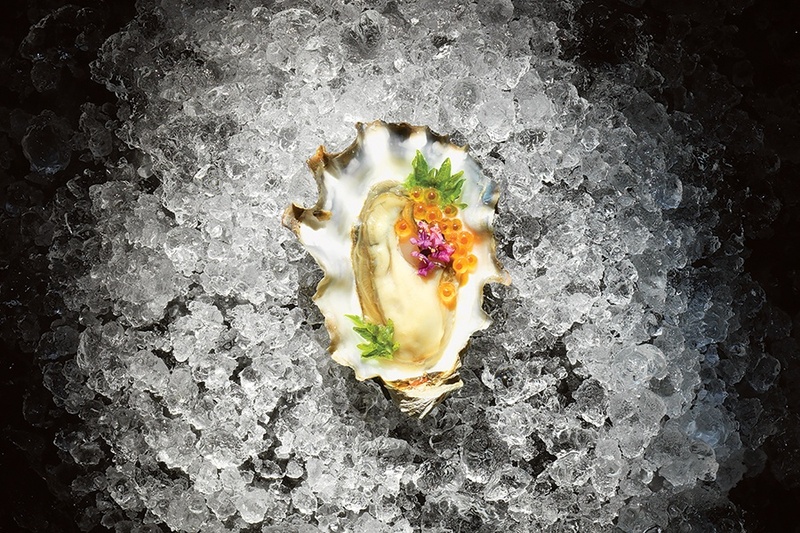 Forget classic cocktail sauce and mignonette—these days, the humble oyster is getting dressed up with increasingly creative accoutrements. At Oak + Rowan, chef Justin Shoults offers competing “East Coast vs. West Coast” bivalves: The former, served broiled, might be adorned with rosemary guanciale; the latter, offered raw, dressed with combinations like watercress granita with celeriac and a drizzle of olive oil. However shucked, they’re superb. Boston kingfish Chris Parsons on his two new restaurants—and the state of the sea right now.You’re opening the Oyster Club, a New England seafood restaurant, in May, and Lily P’s, which pairs oysters with fried chicken, this summer. How has Boston’s seafood scene evolved since your first restaurant, Catch, closed in 2010?I’m no trend-chaser or trend-follower. I don’t see myself as a trendsetter, either. What has changed is the development of sources—the ability to connect with fishermen used to be somewhat limited. There are more opportunities to build those relationships. What memory best sums up your love of seafood? A good friend of our family has a house on Saquish. At low tide, we’d walk the flats and dig for clams. He has a boat, so we’d spend the day fishing. We’re all in this beautiful cottage overlooking the water, grilling fish, grilling clams, having some cold beer. To me, that’s quintessential New England. It makes sense that a spot specializing in Colonial-revival cuisine would go all in on New England’s favorite crustacean. For a real Sunday-brunch eye-opener, chef Marc Sheehan poaches lobster meat first in a court bouillon that swaps wine for hard cider—then again in butter. It’s served with a poached-egg-topped popover, perfect for sopping up a sea of hollandaise seasoned with rendered bacon fat and smoked maple syrup. There are only nine seats at this secret sushi restaurant within Shore Leave, a new subterranean tiki bar. Chef Colin Lynch preps about 14 inventive courses highlighting fish from Tokyo’s famed Tsukiji market alongside local catch such as Maine uni. Nightly changing options have included kombu-cured sea bream with pickled cherry blossom, and clam chowder with plankton oil. The one thing the dishes have in common? They blend East and West swimmingly. A twist on a family recipe, the fluffy steamed buns at Tracy Chang’s Japanese tapas joint are jet-blackened with squid ink. They’re a fashionable foundation for panko-fried oyster; bright-purple cabbage and shallots pickled with rice wine vinegar; and “norioli,” garlicky Spanish alioli mixed with nori. The acid- umami contrast is striking—just like the look. Every month, only about 10 of these über-rare, ultra-rich New Zealand–farmed salmon reach restaurants worldwide. Legal Harborside scores up to two, the only Northeast restaurant to receive them besides New York City’s famously luxe Per Se. Each first-class fish weighs at least 30 pounds and yields about four dozen plates—such as poke with papaya and pickled cherry tomatoes. They tend to move fast, so hook ’em while you can. For a while, chef Ken Oringer’s uni spoon was the only one-bite dose of urchin Boston needed. 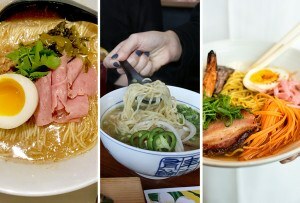 Then Michael Mina and Ken Tominaga delivered downtown’s Pabu, a chic izakaya/sushi bar, and its signature Happy Spoon. Featuring uni, raw oyster, sake- and-soy-marinated ikura (salmon roe), and snappy tobiko (flying fish roe) swimming in a tiny pond of ponzu crème fraîche, it’s proof that big flavors come in small packages. Chef Will Gilson may be a Mayflower descendent, but he’s not afraid to eschew tradition at his modern-Yankee bastion in Cambridge. One top seller: this delicate deli-inspired dish, originally created for a culinary competition using “scrap” fish parts. Gilson cures swordfish belly in salt and sugar like gravlax, then smokes it with pastrami spice. The result, sliced super-thin, comes with pumpernickel purée, pickled veggies, and mustardy gelato—the rye stuff indeed. Chilled shrimp is so 2018. 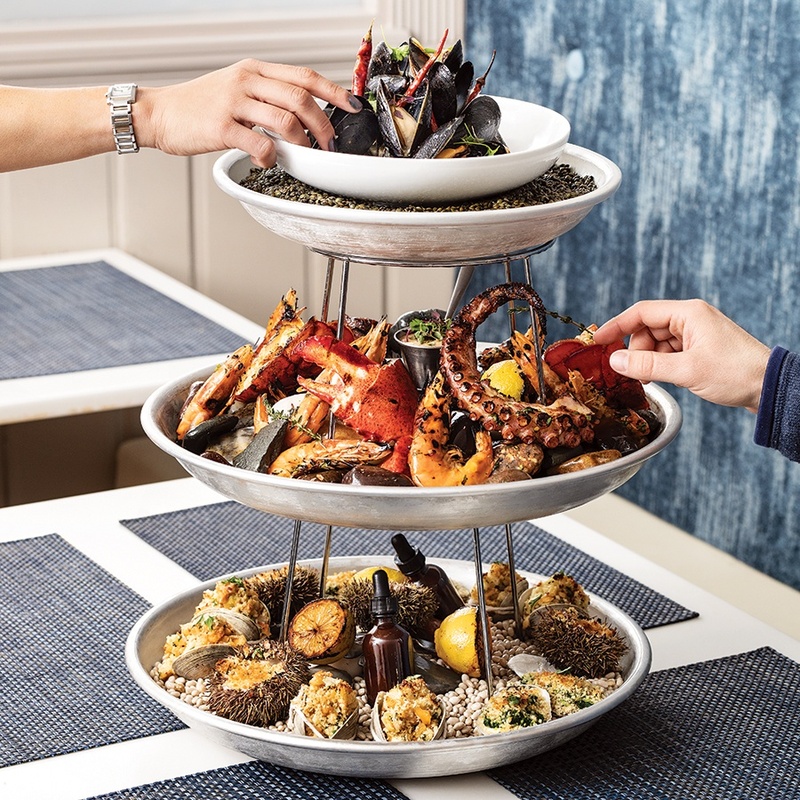 This year, it’s all about the cooked fruits de mer at Il Molo (“the pier” in Italian), where chef Pino Maffeo loads dramatic three-tier towers with hot ­spinach-and-Parmesan-packed oysters Rockefeller, grilled octopus, steamed Maine mussels, and Cape Cod–dug clams casino. Especially popular with expectant diners who can’t eat raw shellfish, it’s as head-turning as a cold tower—and way cooler to boot. So deadly is the blowfish’s poison in Japan, only licensed chefs are allowed to prepare it. 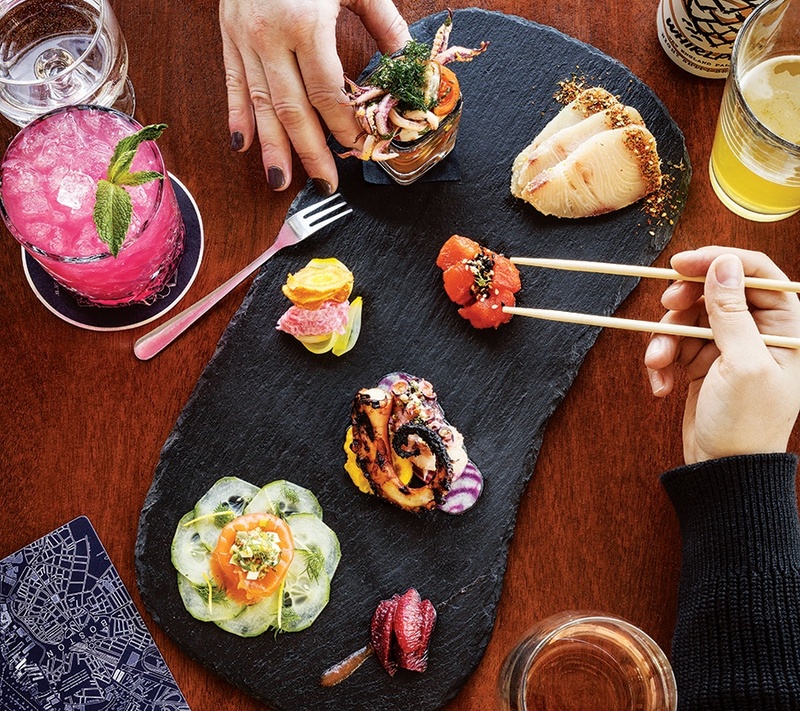 Relax: At this sleek sashimi bar and Japanese street-food purveyor, chef Tony Messina uses the toxin-free northern puffer breed. The tails are marinated in buttermilk and Sapporo beer, battered in breakfast cereal, slathered with spicy Buffalo sauce, and served with pickled celery and blue cheese. Sick to death of Buffalo shrimp? Here’s the antidote. Finally, eco-conscious chefs are using bony fish collars, often discarded stateside in favor of neat fillets but long popular in Asian cultures. Years before others caught on, Seizi Imura’s stellar kama menu spotlighted the clavicle-meat cuts, deeply flavored by fat. Juicy, brisket-like madai (sea bream) is simply cooked with salt; rich kinki (rockfish) is braised with soy, mirin, sake, and ginger. Waste not—we want more and more of these. Dining doyenne Lydia Shire, whose lobster pizza remains a Boston seafood classic, recently revealed this gateway plate to the tinned seafood trend (see page 74). Southern Italian–style linguine is tossed with garlic, yellow raisins, toasted pine nuts, and whole Mediterranean sardine fillets—the ­olive-oil-packed can served open on the plate—as salty foils to the peppery pasta. When the James Beard Award–winning chefs behind Portland, Maine’s Eventide Oyster Co. brought a fast-casual spinoff to the Fenway, Boston collectively cheered the arrival of the famous lobster roll, a split-top steamed bun—soft and yielding, like bao—stuffed with sweet meat. It offers the same punch of amber-hued brown butter, with a bonus: Boston’s roll is slightly larger than the Portland original. Beastly appetites appreciate this seafood joint—slated to spawn a Salem location this month—where titanic rolls range from a generously filled 3-incher to the 5-foot-long “Monstah” with 15 pounds of meat from about 80 lobsters. (Priced around $900, it feeds 60.) Gimmicky? Sure. Great? Yes, thanks to filler-free ingredients: whole knuckle, claw, and tail meat with heirloom tomatoes and butter lettuce on a challah roll. This waterfront mooring from chef Marc Orfaly has offered on-trend seafood charcuterie in its yacht-club-chic dining room since opening; new seasonal selections include smoked salmon and trout pâté with accents such as calamari salad and beet tzatziki. Expect more at Quincy’s Marina Bay, where a second ReelHouse opens in June—linked to the original (and Charlestown sibling Pier 6) by complimentary boat shuttle. 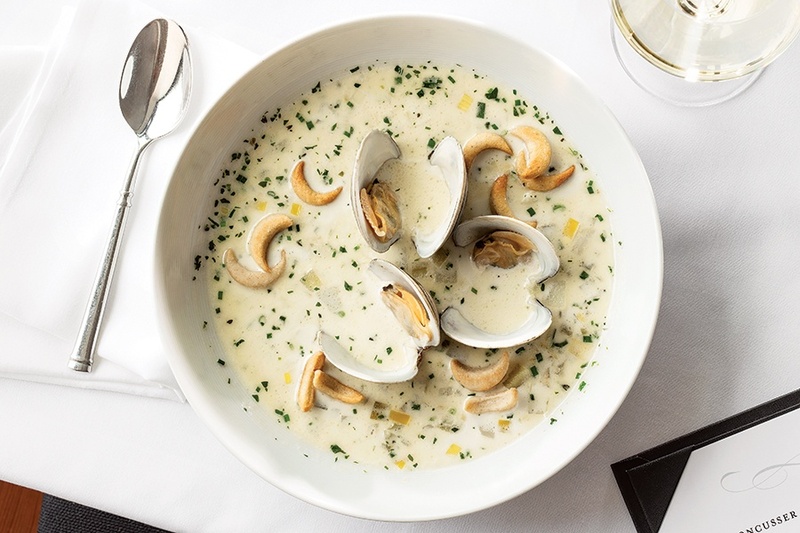 Chef Carolyn Johnson’s killer chowder is the perfect calibration of class and comfort food: in-the-shell clams, skate, and scallops sit in steaming broth finished with crème fraîche and half-moon-shaped crackers. 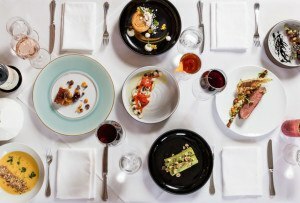 Naturally, it’s served in every part of her multi-concept seafood operation: the main dining room, which features elegant tasting menus; Moon Bar, emphasizing bites like smoked mussel toast; and casual Cusser’s, a takeout window doling out lobster rolls. 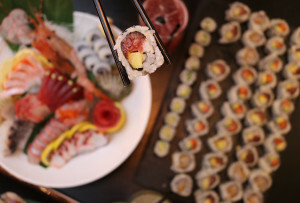 It was probably inevitable that this funky Fenway sibling to chef Tim and Nancy Cushman’s posh sushi palace, O Ya, would upgrade game days with a seafood hot dog. Shrimp farce made with pork fatback and spices is cased and smoked, grilled on the robata, loaded into a hot-dog bun, and garnished with house-made kimchi, sesame seeds, and kabayaki (eel) sauce. Frankly, we love it. At Harvest, hotshot chef Tyler Kinnett creatively riffs on New England cuisine within the fine-dining format. See: his most-elegant boil-inspired seafood bowl, anchored by sustainable redfish (rather than lobster), local scallops, clams, and mussels. Kinnett roasts it all in brown butter with lemon, then adds supple lobster-roe gnocchi. Lemongrass-seaweed broth with bonito flakes and local mushrooms is poured on tableside, completing the shack-to-chic transformation. Hooked brings pier-fresh catch—exclusively from small local fishermen—to the vendor-stuffed Bow Market. Its grab-and-go menu covers poke and fish tacos, but the sandwiches bring the most bliss: think cream-cheese-schmeared bagels with bluefish pâté and pickled veggies, and brioche BLTs with salmon bacon from Boston Smoked Fish Co., a small-batch maker in Boston Public Market. 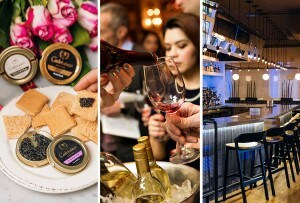 Food halls are the future of city dining. And with Hooked, we see why. Leave a good thing (mostly) alone. That’s the philosophy behind Michael Serpa’s “taverna-style” Greek fish, unchanged on his menu since opening and a favorite among regulars for its stellar simplicity. It’s oven-roasted then pan-seared—yielding crisp skin and tender flesh—and served intact, fin to tail, with fennel, fingerlings, and a sauce of parsley, mint, ­oregano, and olive oil. The net effect: pristine product, immaculate execution. 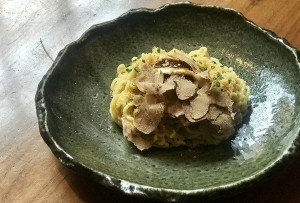 If the Belgian classic got an Italian makeover, it’d resemble this modern trattoria’s menu mainstay. Chef Chris Willis’s mussels soak up a slightly citrusy broth of wine, tomatoes, and toasted coriander, with striking black arancini (courtesy of umami-heavy squid ink) standing in for French fries. It’s finished with chili oil and fragrant kaffir-lime aioli—flavors not typically found in Italian cuisine, but another winning twist. 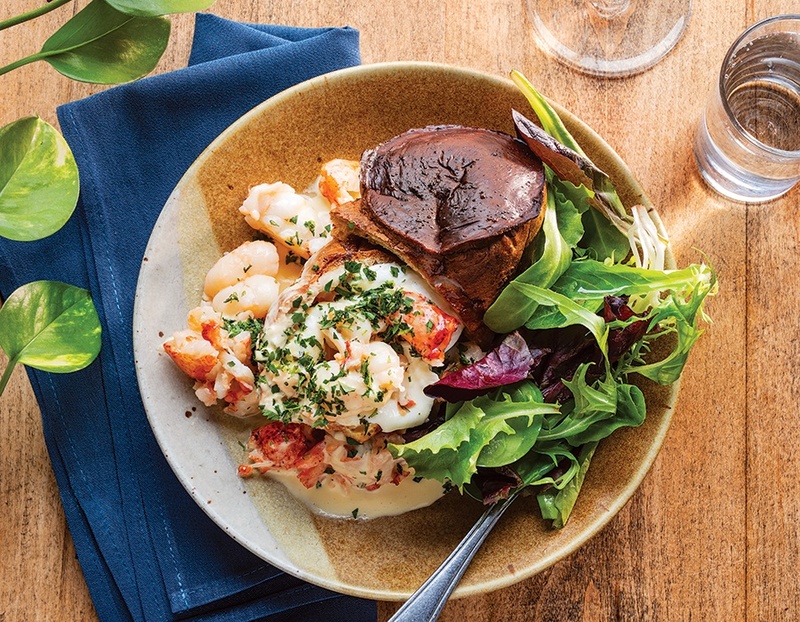 Stirred by his love of the classic creamy bowl, chef Michael Bergin created a new seafood-inspired pie at this pork-heavy favorite. The Neapolitan-style crust features a white base of roasted garlic and sour cream sprinkled with white-wine-cooked Wellfleet clams marinated in olive oil, chili flakes, and lemon. Next comes crispy bacon (a’course! ), sliced red bliss potatoes, grilled scallions, and Parmesan. Chef Michael Scelfo’s coastal-cuisine specialist, Waypoint, is packed to the gills with seafood (check out the caviar-topped doughnut holes on page 73). But riding the local wave of fancied-up finger foods, his latest venture, the Longfellow Bar, also excels with an unexpectedly excellent shellfish snack: two open-faced wontons topped with sweet and mild blue crab meat, sliced jalapeños, and scallions, all doused in a decadent cream cheese sauce. Dig your claws in. At his funky New Orleans–inspired restaurant, chef Jason Santos puts a uniquely New England spin on the southern tradition of peel-and-eat shrimp: He poaches the shellfish in Old Bay and Narragansett Del’s Shandy, a collaboration between the Ocean State beer and lemonade makers. They’re served with a trio of condiments: malt vinegar mignonette, red pepper-flaked “atomic” horseradish cream, and cocktail sauce spiked with Crystal Hot Sauce, a Louisiana staple. Many local spots serve ceviche, but chef JuanMa Calderón gets a special shout-out for a crazy-fresh, fabulously flavorful rendition of his native Peru’s traditional dish. The mixed-seafood version—blue cod, shrimp, and squid—is prepared with a vibrant salsa madre (“mother’s sauce”) of ají amarillo chili, ginger, and celery. In Latin, “Celeste” means heavenly. With this light, bright standout, we agree.